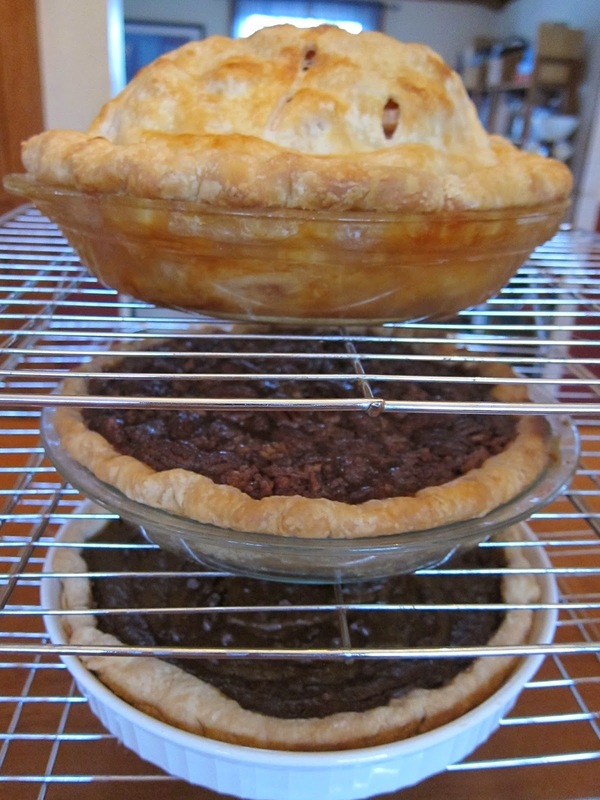 The Canning Doctor: Pie Crazy! The chocolate sweet potato pie came from this recipe but instead of using chocolate shavings, I mixed 2 oz of chocolate chips with the mashed sweet potatoes and then sprinkled mini chocolate chips on the top just before baking. The pecan pie recipe came from here. The maple candied bacon was made in 2 batches and crumbled so it will be ready to sprinkle on top. I had a little, it was all I could do to not eat the whole thing. After all the pies were made, I had enough leftover crust for 3 strawberry-rhubarb tarts (one was my breakfast...). Later this afternoon, I will be trying to make venison meatballs for dinner. Hopefully, yum! I ended up buying uncured pancetta since the meat counter staff had never even heard of caul fat.